The equity bull market continued its run through quarter-end, driven in large part by technology stocks, but are current sector concentrations a harbinger of things to come? 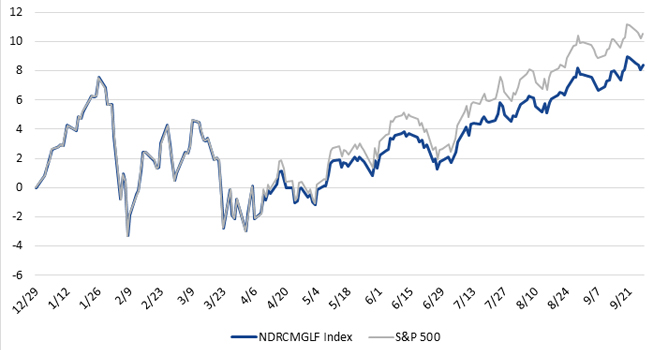 After fully allocating to equities on August 29, 2018, the Market Pulse model that informs the Ned Davis Research CMG US Large Cap Long/Flat Index saw its positive trend continue as market breadth improved. Since the change, healthcare stocks contributed most to returns while financials and the new communication services sector softened modestly. Still, for the quarter ending September 30, 2018, technology and healthcare stocks were the main contributors to the S&P 500®’s ongoing ascent. No matter how you calculate it, the U.S. equities market has experienced one if its longest bull runs, if not the longest, in history. Technology stocks, even after recent GICS®1 sector reclassifications, made up over 20% of the S&P 500, a level of sector concentration not seen since before the Tech Bubble of 2000. Tech stocks went on to become over 30% of the market before the Tech Bubble burst. Considered another way, over 40% of the S&P 500’s return through September 30, 2018 came from only four stocks. In 1999, over 40% of the full year return of the S&P 500 was attributed to five stocks. Over the last 19 years, the only other sector to see exposure in the S&P 500 of over 20% was financials, before the 2007-2009 Financial Crisis. In a recent webinar, Running with the Bulls Safely in Today’s Market, we explored the current state and outlook of the market with Robert Schuster of Ned Davis Research (NDR) and Steve Blumenthal of CMG Capital Management Group, Inc. According to the many indicators NDR looks at, the economic backdrop looks stable at least until the middle of next year, a pre-election year, which is generally the weakest year of the four-year election cycle. Nonetheless, the stock market is a leading indicator. Given the age of the bull market, corrections may occur before a recession is evident, as we have seen in the first week of October. While still just a correction, you just don’t know when a correction will turn into the next bear market or bounce back to continue making new highs. 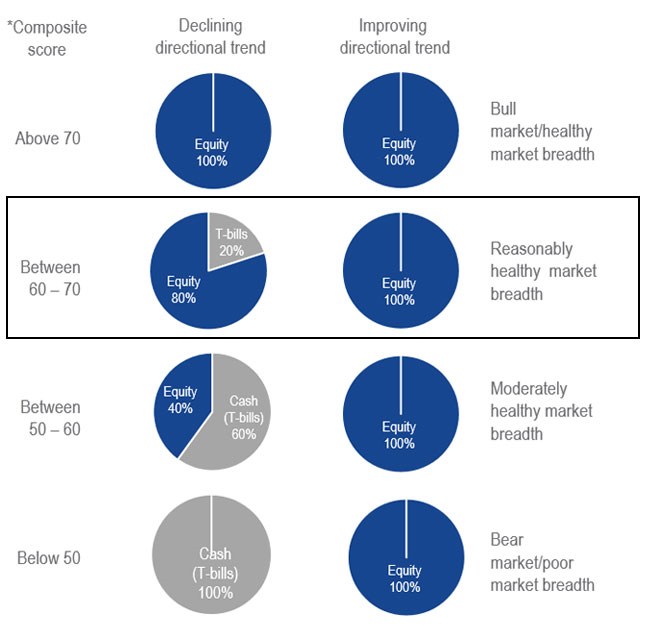 There are a few key reasons why measuring market breadth provides sound trend analysis for guiding equity allocations. Steve Blumenthal of CMG Capital Management Group, Inc., the Index’s co-developer, wrote a whitepaper, Risk Management for all Markets, detailing this tactical approach. Mainly, market breadth has typically weakened before top-line prices have at major market peaks, and breadth thrusts3 often occur just before major bull market recoveries. Furthermore, the S&P 500 is considered a very efficient market, meaning the underlying securities’ fundamentals and macro environmental factors tend to be priced in almost immediately. On April 10, 2018 the model reduced equity allocation to 80% as the directional trend of the Composite Score had turned negative. Reactions to the escalating trade tariffs and an embattled technology sector induced a more pronounced risk-off market sentiment, and the S&P 500 had turned negative for the year. On August 29, 2018 the model allocated to 100% equity as the Composite Score trend turned positive. Market health began to improve beginning late July after another strong earnings season. Source: FactSet. Data as of September 30, 2018. Past performance is no guarantee of future performance. Index performance is not indicative of fund performance. Indices are not securities in which investments can be made. Index returns do not reflect a deduction for fees & expenses. See index descriptions and additional disclosures below. View the daily updated model. 1Global Industry Classification Standard (GICS®) is a widely accepted equity securities classification system developed by Morgan Stanley Capital International (MSCI) and Standard & Poor’s. 2Allocations to equities (long) represented by the S&P 500 Index. Allocations to cash (flat) represented by the Solactive 13-week U.S. T-bill Index. 3Source: Ned Davis Research. Breadth thrust is a technical indicator used to ascertain market momentum and signals the start of a potential new bull market after what may have been an oversold market. 4Source of all data unless otherwise noted: FactSet and Ned Davis Research. Data as of 9/30/2018. Not intended to be a forecast of future events, a guarantee of future results or investment advice. Historical performance is not indicative of future results. Current data may differ from data quoted. Any graphs shown herein are for illustrative purposes only. The indices listed are unmanaged indices and do not reflect the payment of transaction costs, advisory fees, or expenses that are associated with an investment in any underlying exchange-traded funds. Certain indices may take into account withholding taxes. Index performance is not illustrative of fund performance. Fund performance current to the most recent month end is available by visiting vaneck.com. Indexes are not securities in which an investment can be made. Ned Davis Research CMG US Large Cap Long/Flat Index is a rules-based index that follows a proprietary model developed by Ned Davis Research, Inc. in conjunction with CMG Capital Management Group, Inc. The model produces daily trade signals to determine the Index’s equity allocation percentage (100%, 80%, 40%, or 0%). When allocated to a percentage of equities (long), that portion of the Index will comprise the S&P 500 Index. When allocated to a percentage of cash (flat), that portion of the Index will be allocated to the Solactive 13-week U.S. T-bill Index. Solactive 13-week U.S. T-bill Index is a rules-based index mirroring the performance of the current U.S. 13-week T-bill. S&P 500® Index consists of 500 widely held U.S. common stocks covering industrial, utility, financial and transportation sector. VanEck Vectors® NDR CMG Long/Flat Allocation ETF (LFEQ, or the Fund) provides risk-managed exposure to S&P 500 equities using multiple technical indicators that help determine when to be in the market and by how much. The Fund seeks to track its respective Index, designed by Ned Davis Research, Inc. (NDR) and CMG Capital Management Group, Inc. (CMG). The Fund is subject to risks associated with equity securities, index tracking, investing in other funds, operational, U.S. Treasury bills, market, high portfolio turnover, fund shares trading, premium/discount risk and liquidity of fund shares, passive management, absence of prior active market, authorized participant concentration, trading issues and concentration risks. The Fund is considered non-diversified and may be subject to greater risks than a diversified fund. The Fund is not sponsored, endorsed, sold or promoted by Ned Davis Research, Inc. or CMG Capital Management Group, Inc. NDR and CMG make no representation or warranty, express or implied, to the owners of the Fund or any member of the public regarding the advisability of investing in securities generally or in the Fund particularly or the ability of the Index to track the performance of equities market. NEITHER NDR NOR CMG GUARANTEE THE ACCURACY AND/OR THE COMPLETENESS OF THE INDEX OR ANY DATA INCLUDED THEREIN AND NEITHER NDR NOR CMG SHALL HAVE ANY LIABILITY WHATSOEVER FOR ANY ERRORS, OMISSIONS, OR INTERRUPTIONS THEREIN. NDR AND CMG MAKE NO WARRANTY, EXPRESS OR IMPLIED, AS TO RESULTS TO BE OBTAINED BY LICENSEE, OWNERS OF THE FUND, OR ANY OTHER PERSON OR ENTITY FROM THE USE OF THE INDEX OR ANY DATA INCLUDED THEREIN. NDR AND CMG MAKE NO EXPRESS OR IMPLIED WARRANTIES, AND EXPRESSLY DISCLAIM ALL WARRANTIES OF MERCHANTABILITY OR FITNESS FOR A PARTICULAR PURPOSE OR USE WITH RESPECT TO THE INDEX OR ANY DATA INCLUDED THEREIN. WITHOUT LIMITING ANY OF THE FOREGOING, IN NO EVENT SHALL NDR OR CMG HAVE ANY LIABILITY, JOINTLY OR SEVERALLY, FOR ANY SPECIAL, PUNITIVE, INDIRECT, OR CONSEQUENTIAL DAMAGES (INCLUDING LOST PROFITS), EVEN IF NOTIFIED OF THE POSSIBILITY OF SUCH DAMAGES. Fund shares are not individually redeemable and will be issued and redeemed at their net asset value (NAV) only through certain authorized broker-dealers in large, specified blocks of shares called “creation units” and otherwise can be bought and sold only through exchange trading. Shares may trade at a premium or discount to their NAV in the secondary market. You will incur brokerage expenses when trading Fund shares in the secondary market. The information herein represents the opinion of the author(s), but not necessarily those of VanEck, and these opinions may change at any time and from time to time. Non-VanEck proprietary information contained herein has been obtained from sources believed to be reliable, but not guaranteed. No part of this material may be reproduced in any form, or referred to in any other publication, without express written permission of VanEck.